The Elvenar event, “Carnival” runs on beta from February 6, 2019 through February 26th, 2019. It has now been announced that it will begin on live worlds February 22, 2019. “Carnival” quest event is similar to the Winter Magic event we had this past winter. We can also collect additional Candies from around the city. We can earn 1, 2, or 3 additional candies for each one we click. Candies can be found around your city in the same locations that Neighborly Help Reward Chests appear. We spend Candies by investing them into chests for a chance of one of several prizes, and to earn “Flags” towards the grand prizes. There are a total of 9 chests, and 3 are presented at a time. 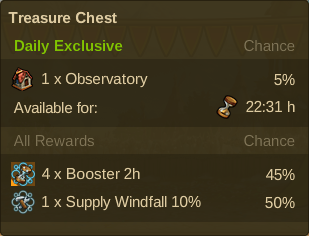 Each time you open a chest, they spin, and 3 new chests are presented. There is not a set ratio of candies to flags; each chest gives a different amount of Flags per Candies. 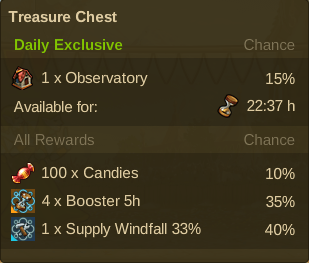 This may make a difference in which chests to choose. Some pay very good Flags per Candies, some do not, but offer higher chances at other great prizes. The ‘best’ choice for each player will depend on their goals, and which items they want to win the most. The following chart shows cost per single item in Candies, when considering both the probability of winning each item, including extra Candies, and the cost per attempt. The lower the value/cost, the better choice it is. 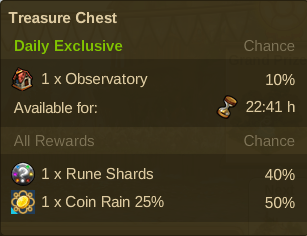 Click the name of any treasure chest for more details. Best choice for time instants. 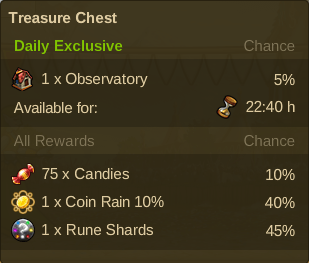 2nd worst choice for daily exclusive prizes. Best choice for Rune Shards. 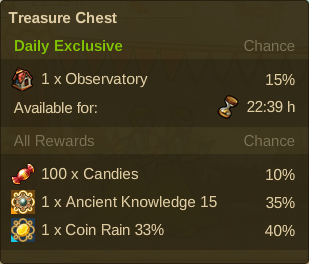 Mediocre choice for daily exclusive prizes. Best choice for Coin Instants. 3rd best for daily exclusive prize. Worst choice for Flag/Grand Prizes. Worst choice for supplies instants. 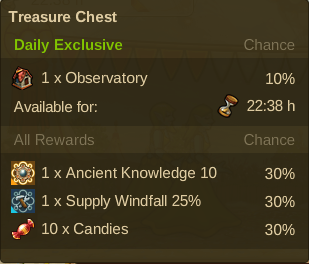 2nd best choice for daily exclusive prizes. Mediocre choice for flag/grand prizes. Decent choice for daily exclusive prize. 2nd best choice for coin instants. 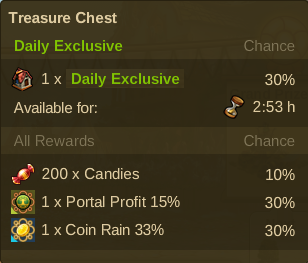 Worst choice for daily exclusive prize. 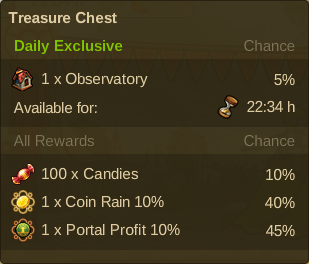 Best choice for portal profit instants. Worst choice for coin instants. Best choice for supply instants. 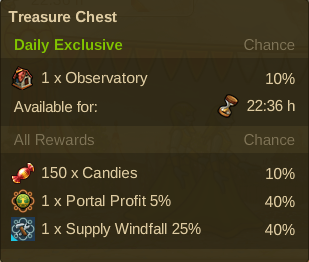 Worst choice for portal profit instants. 3rd best choice for flag/grand prizes. Worst choice for time reduction instants. Second best choice for coin instants. Best choice for daily exclusive prize. 2nd best choice for flags/grand prizes. 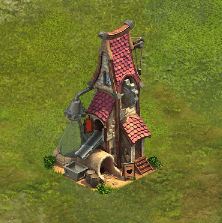 2nd best choice for portal profit instants. Listed below are each of the other new buildings that will be offered on various days throughout the event as the daily exclusive prize. 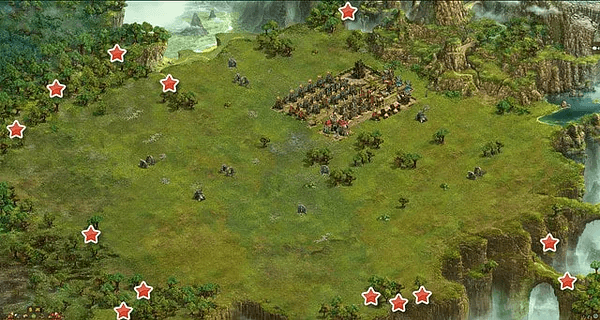 Buildings in addition to those listed here may also be offered, including repeats from previous events as this is not uncommon, but included here are only those buildings introduced for the first time during this event. The prize that you receive is based on the chapter you are in when it is placed into your inventory. Once you’ve accepted the prize into your inventory, its value will not change. This is still true even if you have not yet placed it in your city.